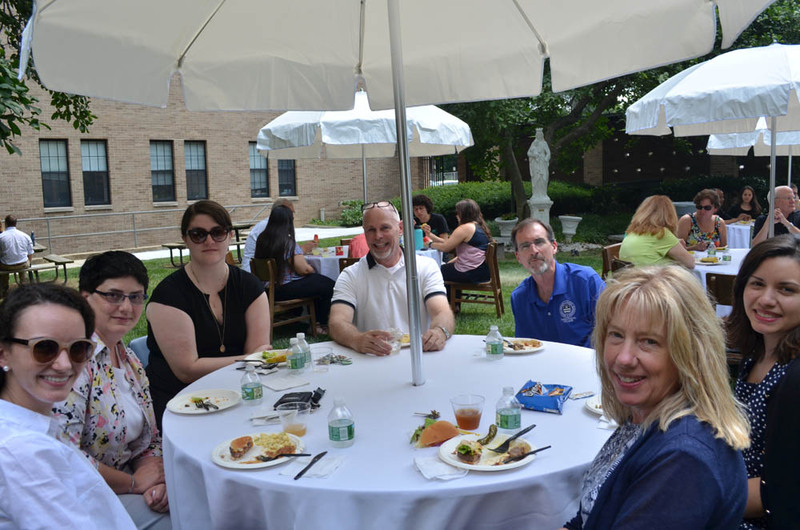 Theological College’s faculty and staff continue their annual mid-summer tradition of welcoming all the McCormick Pavilion tenants to a picnic lunch together in the inner courtyard of the seminary. Life at Theological College takes on a new tenor during summer months as it hosts a wide variety of guests, such as those registered for summer classes at The Catholic University of America’s School of Canon Law, week-long workshops for USCCB interns and youth ministers, and groups involved in work focused on the medieval Bible, Catholic catechesis, human ecology, marriage tribunal, the military archdiocese, and much more. This summer season will see 500 guests passing through TC’s halls! Theological College celebrated commencement at The Catholic University of America on May 12, acknowledging the accomplishments of 10 soon-to-be-ordained theologians of the class of 2018, and 4 Basselin scholars who received their Ph. L. degrees. Most Rev. José H. Gomez, Archbishop of Los Angeles, gave the commencement address. Walter Genito, above, of the Archdiocese of New York, was the first of 15 third theologians to be ordained to the transitional diaconate this year. The ceremony took place in the Crypt Church of the Basilica of the National Shrine of the Immaculate Conception, presided by the Most Rev. John O’Hara, Auxiliary Bishop for the Archdiocese. Theological College hosted its annual Tenebrae, Service of Shadows, at the outset of Holy Week so that the entire house community could participate with faculty and students from Catholic University, family members, and others, before dispersing during the brief break for Triduum and Easter observances. On the occasion of Black History month, Rev. Anthony Chandler (’89) was invited to TC to talk about the history of African American Catholics in America, informing and inspiring seminarians as they prepare for a life of ministry in a multicultural Church. Theological College welcomed Most Reverend Robert Deeley, D.D., J.C.D. (TC Class of 1968), Bishop of the Diocese of Portland, Maine, as the presider for the annual Institution of Ministries Mass at which 31 seminarians were admitted to the ministries of Lector and Acolyte. Once again, Theological College treated seminarians, faculty, staff, and the staff’s family members to a generous evening of holiday cheer, a moment for all to give thanks for the gift of the community at the end of a busy semester. The evening party was prefaced by the Feast of the Immaculate Conception Mass and historic Trinity Dome dedication at the Basilica. 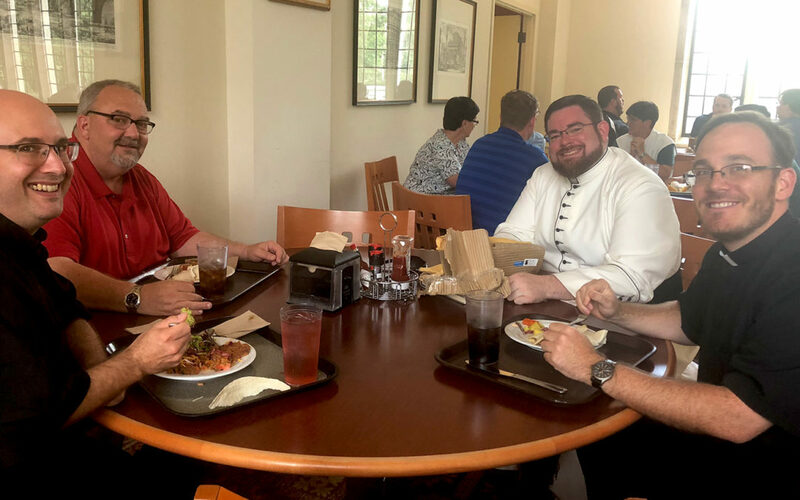 Theological College’s annual hospitality welcoming all bishops during the General Assembly of the U.S. Conference of Catholic Bishops in Baltimore was a great success. This breakfast invitation began almost 25 years ago, in 1973, when Theological College sold the rear part of its property to the National Conference of Catholic Bishops (NCCB — today known as the USCCB) for its new Washington headquarters.